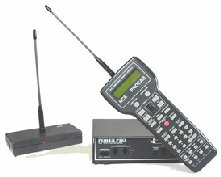 Way back in 2003, I purchased a state-of-the-art wireless DCC system - the NCE ProCab. It's worked well over the last dozen years - as much as I've actually used it, which hasn't actually been all that much. I've done much more layout construction (and moving) than operating over the years. But one day I got invited to an ops session at Craig Bisgeier's Housatonic RR and - bonus! - Tony Koester was going to be there as well and I was looking forward to meeting him. Craig was an awesome host, and the ops session was great (well, until the "burning booster" - but that's another story). But one of my first conversations with Tony still haunts me. . .
At one point during the session, we were chatting and Tony noticed the wireless NCE ProCab I'd brought along to use. Like the photo above, it had the long whippy antenna. "Wow - haven't seen one of those in a while. Be careful you don't poke your eye out." Alas, my ProCab still has that whippy antenna, but I hear tell that there is a "fix" - some way you can do without this antenna and connect/route some antenna wire internally. I'd really like to do that - especially since it's more likely the antenna will knock over trees or other details rather than poke somebody's eye out (though you never know). Have any of you done this conversion? How well does it work? If you have any info on how to do it - or, ideally, know where I can find a step-by-step article - lemme know! Wow, the Bisgeier Railroad Barbeque was that long ago? Seems (and smells) like yesterday! A friend of mine has NCE. He has sent several throttles in for work. I'd presume they'd do the work for you. Anyway, I suggest you contact them. Thanks David! I actually just got my ProCab back from NCE - the thumbwheel had started to malfunction. Unfortunately, I didn't ask them to do the internal antenna while it was there. But I have an article on how to do it, so I guess I'll try(!) Thanks for stopping by the blog and leaving a comment! Just finished the NCE throttle antenna modification - stay tuned for how I did it!